Docking Station was the first Creatures title ported to Linux, thanks to the work of Francis Irving and Ben Campbell. It is possible to run Creatures 3 on Linux, either by copying from an existing install and making some configuration changes, or by using a special installer script from the CreaturesLinux Yahoo Group, instructions This allows you to create and use docked worlds under Linux without having to buy Linux Creatures Internet Edition. Following the original Windows release of Creatures Internet Edition and the later conversion of Docking Station for Linux, it was decided that CIE should also released in a playable form for Linux. 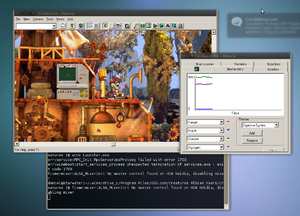 Linux Creatures Internet Edition uses the Linux-ported version of the Docking Station engine, the lc2e, for both the Creatures 3 and Docking Station games. Prior to its release, players could download an installer from the files section of the CreaturesLinux Yahoo group to allow the Linux version of Docking Station to connect with the Creatures 3. When closing an applet, the game occasionally freezes. Sending the TERM signal to the applet process (check 'ps x | grep -i .exe', look for the corresponding process id and run 'kill <PID>' to terminate it) resumes the game. If the View window is displayed incorrectly, disable Allow the window manager to decorate the windows under winecfg. This need to be done if using the Unity desktop environment. WINE will also run the Windows versions of Creatures 3, Docking Station and Creatures Village as well as running the Genetics Kit for Creatures 3 and Docking Station to a limited extent. The only option for running Creatures 2 without Windows seems to be the highly experimental openc2e. The official port of the Docking Station version of the Creatures Evolution Engine, for x86 only. Pretty much the only usable option for Creatures on Linux right now. The Windows and Linux versions are compatible, so you can use agents, breeds and metarooms developed for the Windows versions with the Linux versions of the games. You can also freely swap exported creatures. openc2e is an in-development engine which runs Creatures 1, 2, 3, Creatures Village and Docking Station, but is still in alpha stages. Jagent is a Java suite for creating, compiling, parsing, and otherwise manipulating all sorts of Creatures files. It currently supports C16 files, S16 files, BLK files, PRAY source, and PRAY. LiveGMS is an online genetics editor.It offers a simple interface, and the ability to add a watermark to your work as well as save it to your computer, and open genomes from your computer. Compatible with C3/DS genomes only. Norn Builder is a new cross-platform Creatures developer tool being written by Don. The Norn Builder's main functions include the loading, editing and saving of body data attachment files, converting sprite images between breed slots and games, and for use as a creature-poser for making website clip art. PyGenes is a third party genetics editor for Linux, in development by FishFace. It uses Python, PyGTK and Glade and should be Open Source on completion. Vim is a free text editing program for Linux. The CDN offers a CAOS highlighting addon that also allows Vim to inject CAOS into the game. This page was last modified on 19 January 2018, at 17:56.